This class is used to create particle systems. The particles are approximated with a sphere. They can be of different types (see the details) and radius (that can change with time). They are emitted from different emitters (see the details) with a specified spawn rate. The particles disappear after the set life time period or culled when hitting other nodes. They either collide with the outer surface of the approximation sphere or intersect only by the its center. The particle system can also initialized before it actually appears, so that it starts to be rendered with already spawned particles. In the following example, we create a new particle system, specify its settings by means of C++ API. It is supposed that you have already created an empty C++ project by using UNIGINE SDK Browser. In the AppWorldLogic.cpp file, we create a new particle system, specify its settings and disable the world light source called "sun" to make the particle system visually identifiable. Constructor. Creates a particle system. Casts an ObjectParticles out of the Node instance. Casts an ObjectParticles out of the Object instance. Sets an angle of emission. float mean - A mean value in degrees. float spread - A spread value in degrees. Returns the mean value of the emission angle. The mean value in degrees. Returns the spread value of the emission angle. The spread value in degrees. Sets an angular damping of particles. float damping - A new angular damping. If a negative value is provided, 0 will be used instead. Returns the current angular damping of particles. Returns the predictable bounding box considering the changes of the particle system (velocity, length, etc.). Returns the exact bounding box of the particles system. Enables or disables detecting collision by the outer surface of the sphere that approximates the particles (each particle is approximated with the sphere). This method is slower than intersection detection, but more precise. int collision - 1 to enable sphere-based collision detection, 0 to disable it. Returns a value indicating if collision is detected by the outer surface of the sphere that approximates the particles. This method is slower than sphere center-based intersection detection, but more precise. 1 if the sphere-based collision detection is enabled; otherwise, 0. Returns the point of the particles collision with other objects. int num - The collision point number. Returns the object that collided with particles collided in a given collision point. The object participated in collision. Returns the normal vector for the collision point of the particles with other objects. Returns the velocity in the collision point of the particles with other objects. Velocity values for each of space dimensions. Sets a value indicating if particles should disappear upon collision or intersection. int culling - 1 to make particles disappear; 0 to continue rendering of particles after collision/intersection. Returns a value indicating if particles would disappear upon collision or intersection. 1 if particles would disappear; otherwise, 0. Attaches or detaches a given deflector to the particle system. int num - The deflector number. int attached - 1 to attach the deflector, 0 to detach it. Returns a value indicating if a given deflector is attached to the particle system. 1 if the deflector is attached; otherwise, 0. Enables or disables the given deflector. int enabled - 1 to enable the deflector, 0 to disable it. Returns a value indicating if the given deflector is enabled. 1 if the deflector is enabled; otherwise, 0. Sets restitution of the deflector. Makes sense only for reflectors. float restitution - A new restitution. The provided value will be saturated in the range [0; 1]. Returns the current restitution of the deflector. Makes sense only for reflectors. Sets roughness of the deflector surface. Makes sense only for reflectors. float roughness - A new roughness. The provided value will be saturated in the range [0; 1]. Returns the current roughness of the deflector. Makes sense only for reflectors. Sets dimensions of a given deflector. const Math::vec3 & size - New dimensions. Only the first two components are taken into account (x and y). Returns the current dimensions of the given deflector. The current dimensions. Only the first two components should be taken into account (x and y). Sets a transformation matrix for a given deflector. This matrix describes the position and orientation of the deflector. const Math::Mat4 & transform - A new transformation matrix. Returns the transformation matrix of a given deflector. This matrix describes the position and orientation of the deflector. The default is the identity matrix. Sets a type of a given deflector. int type - DEFLECTOR_REFLECTOR or DEFLECTOR_CLIPPER. Returns a type of a given deflector. Sets delay of particle system initialization relative to the parent particle one. float mean - A mean value in seconds. If a negative value is provided, 0 will be used instead. float spread - A spread value in seconds. Returns the mean value of particles initialization delay relative to the parent particle system. The mean value in seconds. Returns the spread value of particles initialization delay relative to the parent particle system. The spread value in seconds. Enables or disables depth sorting of particles. The depth sorting is required, if particles use alpha blending. int sort - 1 to enable the depth sorting, 0 to disable it. Returns a value indicating if depth sorting of particles is enabled. The depth sorting is required, if particles use alpha blending. Sets a duration of each particle emission in seconds. Returns the current mean value of particle emission intervals. Returns the current spread value of particle emission intervals. Sets a value indicating if particles should follow emitter transformations, i.e. the direction of their flow should change after the emitter. int based - 1 for particles to follow emitter transformations; 0 for them to flow independently. Returns a value indicating if particles follow emitter transformations, i.e. the direction of their flow changes after the emitter. 1 if particles follow emitter transformations; otherwise, 0. Sets a value indicating if additional spawn points should be generated when the emitter is moved, which provides a continuous flow of particles. int continuous - 1 to create the continuous flow of particles; 0 to create the discrete flow with sparse generation points. Returns a value indicating if additional spawn points are generated when the emitter is moved, which provides a continuous flow of particles. 1 if particles are created in the continuous flow; otherwise, 0. Sets the direction of particles emission along the axes. const Math::vec3 & direction - The emission direction. Returns the current direction of particles emission along the axes. Enables or disables particle emission. int enabled - 1 to enable particle emission, 0 to disable it. Returns a value indicating if particle emission is enabled. 1 if emission is enabled; otherwise, 0. Sets the maximum number of particles that an emitter can possibly spawn per one frame. int limit - The maximum possible number of particles. If a negative value is provided, 0 will be used instead. Returns the current maximum number of particles that an emitter can possibly spawn per one frame. The maximum possible number of particles. Sets the rendering order of the particle system inside the particles hierarchy. int sequence - The rendering priority. Particle systems with the lowest order number are rendered first. Returns the current rendering order of the particle system inside the particles hierarchy. Sets a value indicating if the emitter spawns particles only when it is moving. The further it has moved, if compared to its position in the previous frame, the more particles will be spawned. If the emitter is not moving, there are no particles at all. int shift - 1 to enable the shift-based spawning; 0 to disable it. Returns a value indicating if the emitter spawns particles only when it is moving. The further it has moved, if compared to its position in the previous frame, the more particles will be spawned. If the emitter is not moving, there are no particles at all. 1 if the shift-based spawning is enabled; 0 if it is not. Sets a size of the emitter. EMITTER_POINT, EMITTER_SPARK, EMITTER_RANDOM: all vector components are ignored. EMITTER_SPHERE: the first vector component is the radius of the sphere. EMITTER_CYLINDER: the first vector component is the radius of the cylinder, the second vector component is the height of the cylinder. EMITTER_BOX: all vector components are interpreted as box dimensions (x, y, z). Returns the current emitter size. Sets a spread of particles emission along the axes. const Math::vec3 & spread - A spread of particles emission. Returns the current spread of particles emission along the axes. The spread of particles emission. Sets a value indicating if a particle system emitter needs to be synchronized to a parent particle system. int sync - 1 to synchronize the emitter; otherwise, 0. Returns a value indicating if a particle system emitter is synchronized to a parent particle system. 1 if it is synchronized; otherwise, 0. Sets a type of the emitter. int type - The type of the emitter (one of the EMITTER_* values). Returns the type of the emitter. The type of the emitter (one of the EMITTER_* values). Sets an emitter velocity, which is added to the initial velocity of spawned particles. If the value equals 0, the actual velocity of emitter node will be used. const Math::vec3 & velocity - An emitter velocity in units per second. Returns the current emitter velocity, which is added to the initial velocity of spawned particles. If the value equals 0, the actual velocity of emitter node will be used. The emitter velocity in units per second. Attaches or detaches the given force to the particle system. int num - The force number. int attached - 1 to attach the force, 0 to detach it. Returns a value indicating if the given force is attached to the particle system. 1 if the force is attached; otherwise, 0. Sets an attenuation factor for the specified force. float attenuation - An attenuation factor. Returns the current attenuation factor for the specified force. Sets the attraction force that will be applied to the particles in the specified force radius. int num - The attraction force number. float attractor - The force value. Returns the current attraction force applied to the particles in the specified force radius. Enables or disables the given force. int enabled - 1 to enable the force, 0 to disable it. Returns a value indicating if the given force is enabled. 1 if the force is enabled; otherwise, 0. Sets a radius for applying the force. float radius - A radius in units. If a negative value is provided, 0 will be used instead. Returns the current radius set for applying the force. The current radius in units. Sets a rotation force that will be applied to the particles in the specified force radius. int num - The rotation force number. float rotator - The force value. Returns the current rotation force applied to the particles in the specified force radius. Sets a transformation matrix for the specified force. const Math::Mat4 & transform - A transformation matrix. Returns the current transformation matrix for the specified force. Sets a gravity force influencing particles. const Math::vec3 & gravity - A gravity force. Returns the current gravity force influencing particles. Sets a particle growth factor. float mean - A mean value. float spread - A spread value. Sets the damping of particles growth in size. float damping - A new growth damping. If a negative value is provided, 0 will be used instead. Returns the current damping of particles growth in size. Returns the current mean value of the particle growth factor. Returns the current spread value of the particle growth factor. Enables or disables detecting collision by the center of the sphere that approximates the particles. This method is faster than collision detection, but less precise. int intersection - 1 to detect intersections, 0 not to detect. Returns a value indicating if collision is detected by the center of the sphere that approximates the particles. This method is faster than sphere-based collision detection, but less precise. 1 if the sphere center-based intersection detection is enabled; otherwise, 0. Sets a factor of the linear interpolation between the Z axis and the camera direction for the length particles. float flattening - A flattening factor. If a negative value is provided, 0 will be used instead. Returns the current factor of the linear interpolation between the Z axis and the camera direction for the length particles. Sets a factor by which length particles will be stretched. float stretch - A stretch factor. If a negative value is provided, 0 will be used instead. Returns the current factor, by which length particles are stretched. Sets a lifetime duration of particles in seconds. float mean - A mean value in seconds. If a too small value is provided, 1E-6 will be used instead. Returns the current mean value of particle lifetime duration. Returns the current spread value of particle lifetime duration. Sets a linear damping of particles. float damping - a new linear damping. If a negative value is provided, 0 will be used instead. Returns the current linear damping of particles. Sets max time for particles simulation during the warming, in seconds. float time - Time, in seconds. 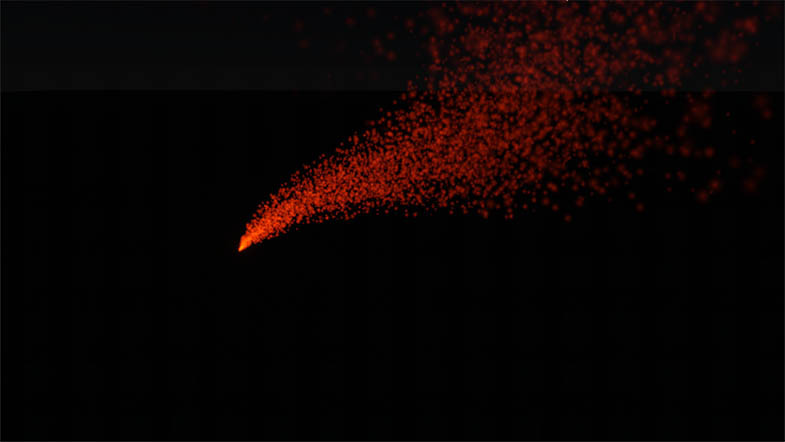 Returns max time value for particles simulation during the warming, in seconds. Sets the noise as an attached. int num - The target noise number. int attached - 1 to enable the Attached flag, 0 to disable it. Returns a value indicating if the given noise is attached to the particle system. 1 if the noise is attached; otherwise, 0. Enables or disables the given noise. int enabled - 1 to enable the noise, 0 to disable it. Returns a value indicating if the given noise is enabled. 1 if the noise is enabled; otherwise, 0. Sets the Force parameter value for the required noise. float force - The noise force value. Returns the Force parameter value for the required noise. Sets the Frequency parameter value for the required noise. int frequency - The noise frequency value. Returns the Frequency parameter value for the required noise. Returns the spatial texture for the required noise. The texture of the noise. Sets the Offset parameter coordinates values for the required noise. const Math::vec3 & offset - Offset coordinates values. Returns the Offset parameter coordinates values for the required noise. Sets the Scale parameter value for the required noise. float scale - The noise scale value. Returns the Scale parameter value for the required noise. Sets the Size parameter value for the required noise. int size - The noise size value. Returns the Size parameter value for the required noise. Sets the Step parameter coordinates values for the required noise. const Math::vec3 & step - Step coordinates values. Returns the Step parameter coordinates values for the required noise. Sets the transformation matrix for the required noise. const Math::Mat4 & transform - The noise transformation matrix. Returns the transformation matrix for the required noise. Returns the total number of particles collisions with other objects. Sets the new number of deflectors. int deflectors - Number of deflectiors. Returns the current number of deflectors. Sets the new number of forces. int forces - Number of forces. Returns the number of the currently acting forces. Sets the new number of noises. int noises - Number of noises. Returns the current number of noises. Returns the current number of particles. Returns the position of a given particle. int num - The particle number. Position coordinates for the particle. Returns the radius of a given particle. Sets the particle system rotation mean and spread values. Returns the particle system rotation mean value. Returns the particle system rotation spread value. Sets a type of particles to emit. int type - A type of particles (one of the TYPE_* values). Returns the type of emitted particles. The type of particles (one of the TYPE_* values). Returns transformation matrices for spawned particles. Vector< Math::Mat4 > & transforms - Array to which the transformation matrices will be added. Returns the velocity vector for a specified particle. Sets an interval of emitter inactivity in seconds. Returns the current mean value of emitter inactivity intervals. Returns the current spread value of emitter inactivity intervals. Sets a bit mask for interactions with physicals. Two objects interact, if they both have matching masks. Returns the bit mask for interactions with physicals. Two objects interact, if they both have matching masks. Sets the mass of the particles. This value matters only for computing physical interactions. float mass - The mass of the particles. Returns the current mass of the particles. This value matters only for computing physical interactions. The mass of the particles. Sets the value indicating the procedural position mode. Returns the value indicating the procedural position mode. Enables particle system rendering to procedural texture. int rendering - 1 to enable rendering to procedural texture, 0 to disable. Returns the value indicating if the procedural rendering enabled or not. 1 if the procedural rendering is enabled; otherwise, 0. Sets the resolution of the procedural texture. const Math::vec3 & res - Resolution of the texture. Returns the resolution of the procedural texture. Sets a particle radius in units. float mean - A mean value in units. If a too small value is provided, 1E-6 will be used instead. float spread - A spread value in units. Returns the current mean value of particle radii. The mean value in units. Returns the current spread value of particle radii. The spread value in units. Sets a restitution value for particles. float restitution - A new restitution value. The provided value will be saturated in the range [0; 1]. Returns the current restitution value for particles. Sets a roughness of the particle surface. float roughness - A new roughness value. The provided value will be saturated in the range [0; 1]. Returns the current roughness of the particle surface. Sets a seed value for the particles' random generator. unsigned int seed - A seed value. Returns the seed value used for the particles' random generator. Sets a rate at which particles are created. float rate - A new spawn rate. If a too small value is provided, 1E-6 will be used instead. Returns the current particle spawn rate. Sets a spawn scale that enables to modulate smooth and gradual initialization of the particle system starting with the given spawn state and up to the specified spawn rate. float scale - A spawn scale. The provided value is clipped to range [0;1]. By the value of 0, there are no spawned particles at the start. By the value of 1, the system is initialized with the specified spawn rate. Returns the current spawn scale that enables to modulate smooth and gradual initialization of the particle system starting with the given spawn state and up to the specified spawn rate. Sets the velocity threshold for spark and random emitters. They spawn particles if the velocity value of the parent particles is high enough. float threshold - A velocity threshold for the parent particles. Returns the current velocity threshold for spark and random emitters. They spawn particles if velocity of the parent particles is high enough. The current velocity threshold of the parent particles. Sets a value indicating if a diffuse texture for the particles is a 4x4 texture atlas. int atlas - 1 if a texture atlas is used; 0 if an ordinary diffuse texture is assigned. Returns a value indicating if a diffuse texture for the particles is used as a 4x4 texture atlas. 1 if a texture atlas is used; otherwise, 0. Sets a value indicating if the initial orientation of particles diffuse texture should be randomly varied along the X axis. int variationx - 1 to add random variation along the X axis, 0 not to add. Returns a value indicating if the initial orientation of particles diffuse texture is randomly varied along the X axis. 1 if there is random variation along the X axis, 0 if there is not. Sets a value indicating if the initial orientation of particles diffuse texture should be randomly varied along the Y axis. int variationy - 1 to add random variation along the Y axis, 0 not to add. Returns a value indicating if the initial orientation of particles diffuse texture is randomly varied along the Y axis. 1 if there is random variation along the Y axis, 0 if there is not. Sets an initial particle velocity in units per second. float mean - A mean value in units per second. float spread - A spread value in units per second. Returns the current mean value of the initial particle velocities. The mean value in units per second. Returns the current spread value of the initial particle velocities. The spread value in units per second. Enables the warm start for the particles. It means that the particle system starts to be rendered with already emitted particles, rather then from a zero point. int warming - 1 to enable the warm start; 0 to disable it. Returns a value indicating if the warm start is enabled for the particles. It means that the particle system starts to be rendered with already emitted particles, rather then from a zero point. 1 if the warm start is enabled; 0 if it is disabled. Returns the current world offset of the local origin of coordinates of the particle system. The offset of the origin of coordinates is changed depending on the position of the particle system so that the particles are simulated near their emitter. Adds a deflector with default settings. The number of the new deflector in the list of deflectors. Adds a spark emitter in the given point. const Math::Vec3 & point - Point for sparks emission. const Math::vec3 & normal - Normal vector of the point of spark emission. const Math::vec3 & velocity - Velocity in the point of spark emission (velocity of source particles or node by contact). Adds a force with default settings. The number of the new force in the list of forces. Adds a new noise with default settings. The number of the new noise in the list of noises. Deletes all particles spawned by the emitter. Removes a given point deflector. int num - The number of the deflector to remove. int num - The number of the force to remove. Returns 1 if the object state was successfully restored; otherwise, 0. When a particle hits a deflector of this type, the particle is removed. When a particle hits a deflector of this type, the particle bounces off it. Box emitter. Particles are emitted from a random point of the box. Cylinder emitter. Particles are emitted from a random point of the cylinder. Point emitter. Particles are emitted from one single point. Arbitrary emitter. Particles are emitted from a random point of their parent node. With an emitter of this type you can create particles, which spawn particles themselves. Spark emitter. Particles are emitted from a single point and imitate sparks. Sphere emitter. Particles are emitted from a random point of the sphere. Particles of this type are camera-oriented and rotating. Particles of this type are camera-oriented and connected with each other at vertices forming continuous flow. Particles of this type are perpendicular to the z-axis of their particle system. Particles of this type are similar to billboard particles, but stretched along the direction of their motion and do not rotate. Particles of this type are similar to billboard particles, but do not rotate. Particles of this type are arbitrary oriented ones. Particles of this type can be used to create tracks from moving objects (for example, foam after a ship). Each Route particle is flat (just like flat particles), but is oriented on the plane in the same way as the emitter when it spawned it.